At RMIT, where I used to work, students would routinely rate the university at 80% or above in quality of supervision, but they would rate the intellectual environment poorly, around the 60% agreement level. That’s a vast different in statistical terms. Here at ANU students are more satisfied overall, but of all the measure of ‘intellectual climate’ is consistently the lowest of all the scales we measure. At RMIT, where there were around 2600 students in a total student population of over 70,000 this sense of being lost in a crowd is perhaps understandable, but at ANU where there are the same number of PhD students in a cohort of only about 22,000 it is very puzzling indeed. It is even more puzzling when you think about the kind of place ANU is. You could spend almost every hour of every day on campus here at ANU going to a presentation, coffee discussion, exhibition or workshop. For a person like me, who is hooked on learning, it’s like being an alcoholic locked up in a liquor store. When you see the breadth of interests and needs being catered for, that score on intellectual climate the ANU students give us goes from puzzling to downright absurd. So why are students reporting a lack of community? Some element is clearly missing – but what? 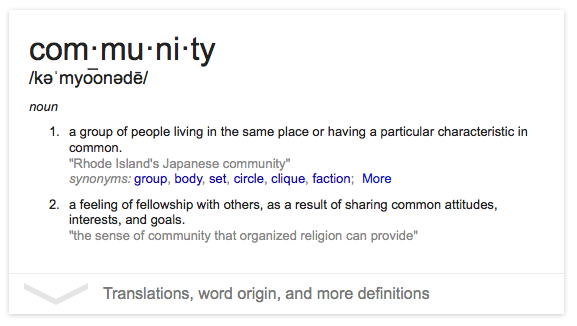 I think there’s a clue right there in the definition of community shown in the image above. Here ‘community’ is defined in two ways: the first as a ‘being together’ in the same physical place, and the second as ‘feeling together’ – a sense of belonging that comes with working with people of like mind and heart. When thought about this way, I can see why it might be possible to inhabit the the incredibly rich ANU intellectual environment and still not feel a strong sense of community. Community is not just about being in the same place or having the same events to go to – it’s about that ‘feeling of fellowship’ that comes with sharing common interests and goals. The quickest way to achieve a sense of belong, aside from religion (and maybe taking drugs), is shared work. If you think about it, the structure of academic work does not give us many opportunities to work together on shared goals. Being an academic is nothing like my previous careers where I worked in large teams. As an architect I worked many, many late nights to meet crazy deadlines. Nothing builds comradery like eating pizza with a team of similarly exhausted people at 11pm after an epic drawing stint. When I worked in a record store we used to go out to see bands together after we closed up at 11pm. If you weren’t feeling a warm glow of fellowship after drinking at blues club in Collingwood until 3am, well – you just aren’t human. Some of the lab sciences are lucky enough to take place in spaces where you can develop these intense feelings of fellowship and shared endeavour – but many, many other academics don’t. The rest of us turn on our computer and commune with the world of thought (or hang out on Twitter – no judgment!) until dinner time. On my research days at home it’s common for me not to speak to a soul. When the male Thesiswhisperers went skiing the other week I didn’t physcially speak to anyone for three whole days. I would have been very lonely without Facebook and Twitter. Last week, at a dinner party, someone said that being an academic is a bit like owning your own, small business. This struck me as being very true. Being an academic is like managing a small shop which doesn’t get many customers each day. You set the performance targets. You decide if your ‘product lines’ (research, teaching) are profitable enough. You might have a few people in to help you in the busy times, but essentially you open and close the shop most of the days. In fact, if I think too much about it, often my working life often feels this way. No wonder many academics report feeling intensely lonely at times. Kate Bowles wrote beautifully about how academic work can make us feel estranged from the rest of the world. For many, the loneliness starts with the PhD itself. I’ve written before about how weird it feels that no one seems to care as much as you. 1) Simply make a regular meet up time for your group or department to have coffee, discuss the course content together and your reactions to it. The course content will launch on Wednesday because I think this a good, mid week catch up day. I call this the ‘book club’ model. 3) Create your own facebook group to connect people online to discuss themes and organise meetups. You could do Facebook group in two ways, either as a ‘virtual community of interest’ (such as for people in African studies as an example) or a ‘local community of practice’ (for people in your location – we’ll be doing Canberra meetups in the Fellows Bar at University House). A virtual community of interest would help you connect scholars in your discipline, the local community of practice could help you connect with and meet people in in your physical location who are doing the MOOC. Facebook groups can be made private, or public – we will advertise and promote the public ones. 4) Keep an eye on the hashtag #survivephd15, which we will be using to do regular Twitter chats. We’ll be ‘harvesting’ this hashtag across multiple platforms using the aggregator ‘Tagboard’ so whenever you use that hashtag, in facebook, twitter or instagram, people will see it inside the EdX course. How about you? Are you interested in trying to build community, either with the How to Survive your PhD course, or some other way? Love to hear your ideas in the comments. This entry was posted in Getting things done, Miscellany and tagged mooc. Bookmark the permalink. This year I transferred to half-time candidature to take up a full-time job. I was astonished to find that people in my workplace are genuinely interested in my research – in a way my university peers never have been. Conversations with the latter seem to be dominated by them trying to prove their academic superiority; conversations with the former are motivated by curiosity. This post and the How to Survive your PhD MOOC are so relevant to my experience. I’m a mature age part time PhD student, and I struggle to find any community. I’m signing up! Some great ideas here and food for thought. I am finishing my PhD and I have been trying to establish a community but it seems that for some students, loneliness is a part of the process and has to be experienced. This may well be further emphasized by some supervisors as well. Thanks for the great post. I very much relate to this. Previous to starting my PhD I worked for a long time as a project manager in a fantastic non-profit organisation where collaboration and community was strong and everyone shared a common goal. It was a very supportive and empowering environment. So I’ve really struggled with the isolation of PhD life. Obviously supervisors are invested in your PhD but it isn’t their project so there isn’t a sense of community with them (in my experience at least). Fortuntately, there is a good sense of community between PhD students in my department, even though we are disperate in our research areas. The MOOC is an excellent idea and I’m very much looking forward to it! A couple of projects ago I had reason to look at loneliness as an issue affecting wellbeing and productivity — back when I was doing community based research on international students and their sexual and reproductive health needs. The literature distinguishes between social and emotional loneliness and they’re both quite different again from the focus of this post on finding community with colleagues in shared work interests. One of my interests as a writer is in trauma, particularly traumatised communities like gay men post-AIDS, and my hunch is that academic research centre cultures reflect some similar dynamics related to the stress of decades of downsizing and transformation. In the literature on resilience there’s a critical strand criticising the discourse of resilience as transferring the focus away from these disruptive processes onto how well individuals and communities adapt. In this light, organising a community of practice around your research interests but not paying any attention to the organisational fairness of your work environment might not yield sustainable benefits. Interesting! I’d love to hear more about your research. I agree about the reslience discourse being used as a ‘band aid’ and silencing tactic in workplaces overcome by the regular restructuring and dislocation. That’s part of why we argued so much about the title of the MOOC. I hope we have provided a critical balance in the material and that the discussions will open up areas for us to critically discuss the resilience narrative. In my research on ‘quitting talk’ I characterised the resilience narrative as a ‘preferred institutional narrative’ following the work of Frank. I feel another post coming on! 1. My research is in an area that nobody, not even my principal supervisor, has much interest in. Yet it is of considerable interest and importance to the industry that I work in. My experience is comparable to that of Anonymous in that non-academic people are far more curious about my research and results to date. 2. Doing a PhD part-time doesn’t leave much time for engaging in the various social activities. We are constantly shuffling work, research and family obligations. 3. Some people are fundamentally loners and when immersed in their work don’t like being disturbed / can’t be bothered with distracting activities. I agree with these, especially #1 & 2. I’m also a remote student which adds a whole new level of complication. My supervisors’ workloads have increased substantially since I first enrolled and I can tell they pretty much forget about me and my research until we all turn up to a monthly teleconference. 4. Two major components of a PhD – engaging with the literature and writing – are inherently individual activities. They require substantial amounts of time and energy (in terms of sustained concentration & focus). Depending on the research, data analysis could also be included in this! 5. Work space provided at the uni (if you’re lucky enough to get it) may not be adequate or appropriate, making it inefficient to turn up to campus. E.g. if you can only do your writing at night, campus probably isn’t the best place to do it. There are certainly parts that have to be done alone – and some people have whole projects which they can only do alone. I’ve recommended this to my undergrad friends – we’re studying at a university whose students are predominately external, so we have the loneliness factor from the beginning of our academic experience. I don’t know how many have signed up, but I’m looking forward to it, despite not being at PhD yet. Hi Inger, thanks again for an interesting post. As Badblood mentioned, resilience (and loneliness) is affected by environment – I’m thinking here especially of ‘call centre type’ arrangements for PhDs in an open plan office where conversation is discouraged so that others may work. This is really dependent on the people in your office. I’ve had three distinct experiences throughout my tenure as a graduate student. During my masters degree I was in a large office similar to that which you described where conversation was frowned upon. I never really met anyone in the office, and though there were people around, I always felt isolated and to a degree, lonely. Then when I started my PhD I moved into a large office with ~20 other graduate students. Throughout most of the day it was essentially silent (save for the drone of white noise from server fans). But once or twice a day, we would all congregate around the office couch/coffee pot for 30min-1hr and chat/commiserate about research/life/whatever. I found that it was a perfect environment because it allowed us to develop a community while still affording us the quiet and isolation we needed to get our research done. I thoroughly enjoyed going into the office every day, and I have never been more productive than when I was in that office. Fast forward a couple of years, and I now have a desk in a similarly sized office, but the bulk of students in that office use it for RA type work as opposed to dedicated research, so there is rarely any peace or quiet – making it impossible to focus or get anything done at all. I’ve all but given up on using that office for anything other than grading papers, and because of it I work from home and I feel more isolated/alone than ever before. lovely post! and we’ll since you asked… I think one of the best things we’ve done to address the loneliness of the thesis writing international student is create a subject that brings together students from a range of disciplines to focus on important and fundamental aspects of the thinking-writing-speaking-learning process, but in an open and community building kind of way – the design of the subject is NOT lecture followed by more alone time and private writing – it uses a wiki to allow everyone to see what others are writing and learn by observation and peer feedback as we go through a standardised process together, working on very different projects but in a similar way, and it coopts the 3 minute thesis presentation model to get students used to talking in public about their project, and it also uses corpus tools to show language learners how they can use their discipline readings as language development opportunities… best of all, the course (in class and online) models sharing behaviour, through sharing the teaching moments, and through social media, so students develop trust and a real sense of belonging – ditching the ‘teacher’ stance and going with a more ‘we’re doing this together’ approach makes the class a joy to teach and learn, it seems… I thank the past few years of access to great open ed for the encouragement and examples of what I practice and the pleasure it brings 😉 and I know no one ever knows enough so I signed up for your mooc the day it opened – can’t wait! sounds fascinating – perhaps you would like to write a post for us on this process and why you think it works? I’d been talking ‘conversations with a dual purpose’ with a colleague/superior. The dual purpose is for collaborative autoethnography and to keep us sane/focused/happy/inspired/productive in our personal research. Opportunities to attend interesting talks around universities generally don’t provide opportunities to make friends unless you’re fairly extroverted. Typically if there are light refreshments afterwards, people from the department hosting the talk will talk to other people from their department and if you are not prepared to walk up to someone else who is by themselves and introduce yourself, you can stand with your drink and fingerfood and feel even more alone than you do sitting at your own desk, reading and writing. Even if it’s your department, you can still stand by yourself if your supervisor isn’t around. And yes, I’ve been a postgrad in one of those open plan offices and you feel very inhibited about talking to other inhabitants for fear of disturbing people who are trying to work. I actually didn’t have enough information about most of my co-residents to be able to check that they were OK when they didn’t show for a number of days, which worried me because one didn’t show for nearly a week and I *had* gathered that she lived on her own even though I didn’t know how to contact her. I agree, Judy. Attending events alone can feel more lonely than anything else. Also, activities organised by an organisation or as part of a work plan often need to have an explicit outcome or benefit. While ‘improving the student experience’ is an explicit target for most universities, ‘improving the staff experience’, ‘building a sense of community for everybody’ and ‘combatting loneliness’ doesn’t seem to be in anyone’s workplan. Even if you do want to attend events, simple things, like a comprehensive ‘what’s on’ guide or a daily newspaper are hard for most universities, even though they are as big as small towns. totally agree – most of my working life is dedicated to thinking my way around this space and trying to come up with ideas. THat’s why the online space is so valuable IMO. If you can connect online first (maybe via twitter), conferences and seminars are a lot less awkward. I enjoy breaking right into those intense groups of department friends to see what’s happening – but I’m reliably told I am an extrovert. I’ve been trying to build a PhD community at my university for a couple of years now using the ‘book club’ model. We’ve had some success (and good departmental support), but the biggest hindrance has been the attitude among my fellow students. Most of them can’t be bothered to show up for presentatios or discussions if they’re not directly related to their own research. And if its ‘just’ social events, the turnout is even worse. So whilst I recognise that many universities could be more supportive, we also have a respoinsibility as students to be supportive! There’s nothing more disappointing than designing an event and having less than 30% of people turn up. We had to introduce a $50 penalty on our events for no shows. This increased our turn out rate to 98% overnight, but it’s annoying that it had to be punative. Thanks, Inger, you’ve made me realise I had entirely inadvertently begun to think about social estrangement as the consequence of the structure of academic work. Yes, I think that’s partly true. But I’m also very interested in responses that think here about the problems for postgrads (and workers) in open plan offices, for whom the socio-scholarly event experience is also reasonably discomforting. I’m the same. As an academic I notice one of the limitations of these social events is that the small talk is often focused on stories of overwork, anxiety and fatigue. I think it’s hard to build community out of these pieces. Rich community takes time, and time is in desperately short supply in higher education. That’s where I think we have room to work, in explaining carefully how the current metrics of productivity are delivering massively perverse outcomes, including the depleting of scholarly community itself. where I tried to talk in a balanced way about things like ‘stories of overwork’ and whether or not it was evidence of a culture of complaint. I’m following this one up with a paper on quitting talk which challenges the narrative of resilience. Belcher and Trowler ‘academic tribes and territories’ puts some flesh on the bones too. So much more to think about in this space – on blogs and outside of them. Wow your post really reminded me how good ANU events are – and of course it’s relatively easy to get to ANU from anywhere in Canberra if you work elsewhere. I used to attend fascinating science lectures at lunch and after work when I worked in the APS – those were the days. Anyway, thought I’d chime in with a quick anecdote from my current university here in Melbourne. I am in charge of organising PhD events for my faculty this year, and I organised some drinks recently because I knew others were craving some sense of community here. Even with three weeks’ warning and an offer of funded food/drinks, plus opening it up to other universities, only four PhDers from my faculty (incl. me) turned up. Sometimes, I feel like my student colleagues are hard to help. PS on a more positive note, there were also a few students from another university, and it was a good night – no complaining about overwork etc as might have been expected! Great post and I resonated with many of the comments. I am happy to work alone most of the time which is just as well because that is what I am doing, but sometimes I just need to ‘talk’ to someone, get another perspective or bounce ideas and thoughts off other people. I try not to dump on my poor, dear husband because if I tell him about ‘problems’, bless him, he wants to fix them but doesn’t really know much about this strange “PhD world” we live in. I just want to enjoy spending time with him and being away from my work and study. I expect this might be the case for many others. I naively expected or hoped that the PhD experience would be like a grown-up version of the camaraderie of my undergrad experience in a architecture studio- haha. There was no on campus community as the School of Architecture is is Launceston and most students live 2 hours away in Hobart. My efforts to build a PhD community in Hobart that met in ‘real life’ were not overly successful and meetings regularly fell over because people kept prioritising other things. I am cross faculty (Architecture and Medicine) and feel that I am not really in either faculty. Now that I study part-time and work full-time in a small, off campus office,and have moved interstate from my ridiculously overworked supervisors, any notion of a ‘real life’ community is even more impractical. I think a post MOOC on-line community is a terrific idea. It’s hard to build a community when the competition for the ever decreasing pool of funding is so vicious. I have faced the same issues at both a big Go8 institution, and a smaller regional university. Our own experience of this has been that what starts out with the best of intentions rapidly devolves into arguments and bullying over funding applications. The fact that the staff in the department also lack this sense of community (for pretty much the exact same reason – funding and job security) does not do well to promote a community feeling towards the students. Such a good post, so resonant of my experiences as a external student. Very interesting post. I’m one of the student leaders at the research institute where I’m based. Like some of the other post-ees, myself and the other student leaders have found it incredibly difficult to engage fellow students over a sustained period of time. Not that we have not tried – we have an annual 2-day retreat, use social media, have regular catch-up sessions + social and academic events throughout the year (almost all of which are funded by the research institute, I might add). There is usually a small surge in ‘engagement’ after a major event but it usually dies off within a few weeks at best. Don’t really know what else we can do, short of man-handling people to attend events (which every now and then sounds very appealing). Picking up on the Shut Up & Write thing – at Charles Sturt Uni, where most students are external, we do on-line Shut Up and Write and also mixed-mode Research Writing Boot Camps. Both of these have resulted in the formation of communities which support eachother across disciplines, but only a small proportion of our students are involved. Those of us who made it to the postgrad conference last year were really excited to meet our ‘friends’ in real life. Others are not likely ever to meet F2F but nevertheless feel supported and included and motivated by knowing that other people are experiencing similar things to them. Again, it requires the courage to front up the first time, but we have designated hosts, part of whose job is to make newcomers feel welcome and included. “Community is not just about being in the same place or having the same events to go to – it’s about that ‘feeling of fellowship’ that comes with sharing common interests and goals. The quickest way to achieve a sense of belong, aside from religion (and maybe taking drugs), is shared work. – staff gave regular seminars on their work. In all, in the dept of history the difference was that postgraduatre students were treated as junior academic members of the dept rather than transitory customers of the research training program. An intellectual community is about more than events to go to: it is about people to go with and an atmosphere of welcome and a sense of sharing, not in a particular project, but in the common endeavour of intellectual enquiry. These things make a dept a place where being a PhD student feels supported, and like a worthwhile thing to do. And it provides a real apprenticeship in academic life. This is a great article, thanks for posting it. I have to agree, the ANU provides a great community that is unparalleled amongst the institutions I have been involved in. There is always something going on. I would call it the PHD student Mecca. Since I finished my PHD, I have moved on to another university in another continent, and people often work at home, or stay secluded in their office. There is no true gathering for coffee/tea like we had at the ANU, and little enthusiasm to support events beyond those that directly involve the person. It is definitely a lonely experience. I think part of the reason there is such a difference is that the ANU has such a large percentage of postgraduate students from overseas, which means there is an incentive for more community based activities. When you are at a university where most people are locally based, they treat it more like a regular job, and have less enthusiasm to be involved in community building. Is there something like “How to Survive Your First Years of Non-Tenured Track Professor”? We also need a sense of community after we have gotten the PhD and are trying to survive the academic job.